Ever since I wrote the first PyImageSearch tutorial on installing OpenCV + Python on the Raspberry Pi B+ back in February 2015 it has been my dream to offer a downloadable, pre-configured Raspbian .img file with OpenCV pre-installed. Today this dream has become a reality. I am pleased to announce that both the Quickstart Bundle and Hardcopy Bundle of Practical Python and OpenCV now ship with a downloadable Raspbian .img files that come with OpenCV pre-configured and pre-installed. All you have to do is download the .img files, flash the appropriate one to your SD card, and boot your Pi. From there, you’ll have a complete Python + OpenCV development environment at your fingertips, all without the hassle of configuring, compiling, and installing OpenCV. To learn more about the Raspbian .img files, keep reading. I went back to my recent tutorials on installing OpenCV on the Raspberry Pi and computed the amount of time it takes to perform each step. Even if you know exactly what you are doing it can take over 2.2 hours to compile and install OpenCV on your Raspberry Pi 3B+. Are you wondering how long the process takes for the Raspberry Pi Zero W? I’m willing to bet that the compile + install process alone takes about 14 hours. I then emailed a sample of novice readers who successfully installed OpenCV on their Pi and asked how long it took them to complete the compile and installation process. Perhaps not surprisingly I found the amount of time for novice readers to install OpenCV on their Raspberry Pi jumped nearly 4x to over 8.7 hours (even longer for the Zero W). 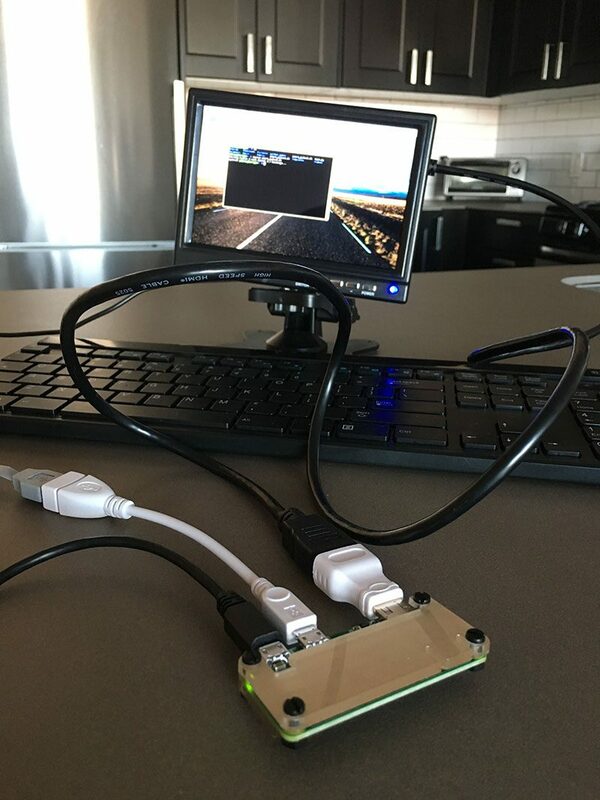 Clearly, the barrier to entry for many PyImageSearch readers trying to learn OpenCV and computer vision is getting OpenCV itself installed on their Raspberry Pi. In an effort to help these readers get the most out of their Raspberry Pi, I have decided to release my own personal Raspbian .img files that have OpenCV pre-configured and pre-installed. Jumpstart your computer vision education by skipping the tedious process of installing OpenCV + Python on your Raspberry Pi. Provide you with my book, Practical Python and OpenCV, the best introduction to the world of computer vision and image processing that you can possibly get. Of course, I will continue to create, support, and provide help to any PyImageSearch reader who is using the many free tutorials I offer on installing OpenCV + Python on the Raspberry Pi. Again, this pre-configured Raspbian .img is intended for PyImageSearch readers who want to save time and jumpstart their computer vision education. If this doesn’t sound like you, no worries, I totally understand — I’ll be still be providing free tutorials to help you get OpenCV up and running on your Raspberry Pi. The rest of this document describes how to install and use the Raspbian pre-configured .img file included in your purchase of the Quickstart Bundle or Hardcopy Bundle of Practical Python and OpenCV. Note: The pre-configured Raspbian + OpenCV .img file is not included in the Basic Bundle. 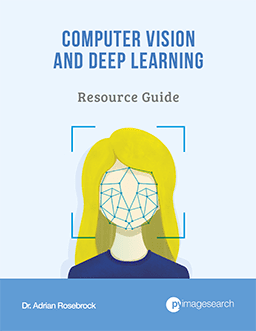 At the end of this guide, you’ll also find answers to frequently asked questions regarding the Raspbian + OpenCV .img file. If you have a question that is not covered in FAQ, please send me a message. Figure 1: After downloading the Raspbian.zip file, unpack it to obtain the .img file that you’ll flash to your SD card. After unzipping you should see the .img file similar to the screenshot above. 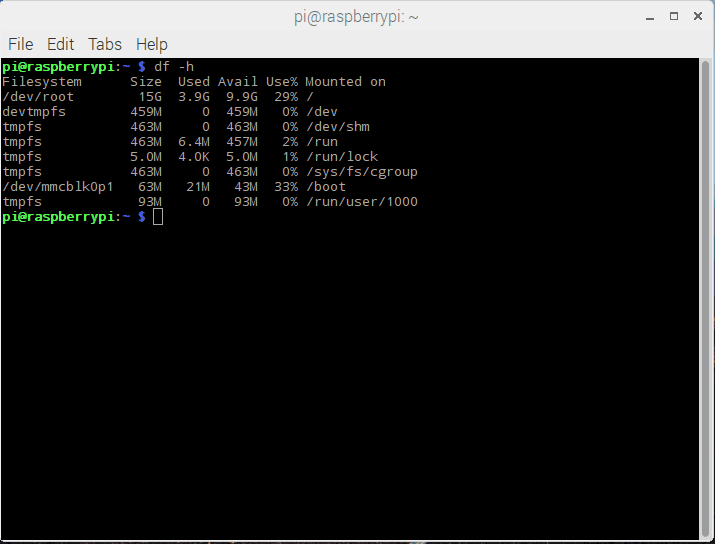 This Raspbian .img will work on 16GB and 32GB SD cards. I have not tested cards larger than 32GB at this time as I do not currently own a card that large. An 8GB card is too small. To write the pre-configured Raspbian .img to your card simply follow the official Raspberry Pi documentation. At the time of this update (2018 Aug 4), the current recommended tool is Etcher and it works with Mac, Linux, and Windows. It even can handle compressed files such as .gz or .zip (no need to extract the .img before loading into Etcher). After writing the the Raspbian .img to your card, insert the card into your Pi and boot it up. On the first boot, your Raspbian filesystem needs to be expanded to fit the SD card. This means that you have to run raspi-config => Advanced => Expand Filesystem manually. After the expansion has completed your Pi will reboot and you will be able to use it as normal (the expansion of the filesystem is only necessary on the first boot). Figure 2: After booting my Raspberry Pi for the first time your filesystem will be expanded to utilize the entire disk. Notice that my entire 16GB card is available and 29% is in use. In order to get OpenCV 3 installed with both Python 2.7 and Python 3 bindings I leveraged Python virtual environments. Each Python virtual environment is totally independent from one another ensuring there are no dependency or versioning issues. In the remainder of this section, I explain (1) what Python virtual environments are and (2) how to access the OpenCV + Python 2.7/Python 3 bindings. What are Python virtual environments? At the very core, Python virtual environments allow us to create isolated, independent environments for each of our Python projects. This implies that each project can have its own set of dependencies, regardless of which dependencies another project has. In the context of OpenCV, this allows us to have one virtual environment for Python 2.7 and then another virtual environment for Python 3. Furthermore, each of these virtual environments can be cloned and have their own set of dependencies for a given project. For a detailed look at Python virtual environments please refer to this tutorial. The source ~/.profile command loads any PATH configurations from your ~/.profile file. The workon py2cv3 accesses the Python 2.7 + OpenCV 3 virtual environment. 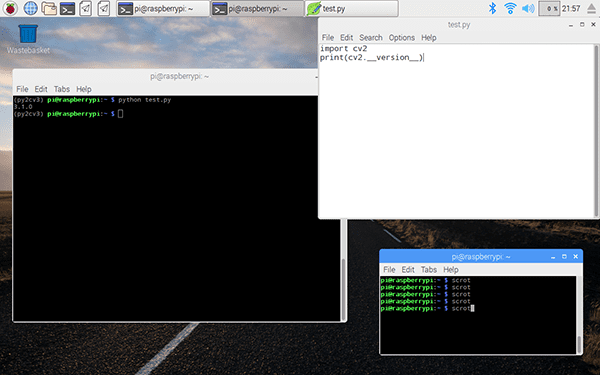 Figure 3: How to access the Python 2.7 + OpenCV 3 environment on your Raspberry Pi. Notice how the text (py2cv3) appears before your shell. This implies that you are in the py2cv3 virtual environment. This command only needs to be executed once for each shell that you open up. 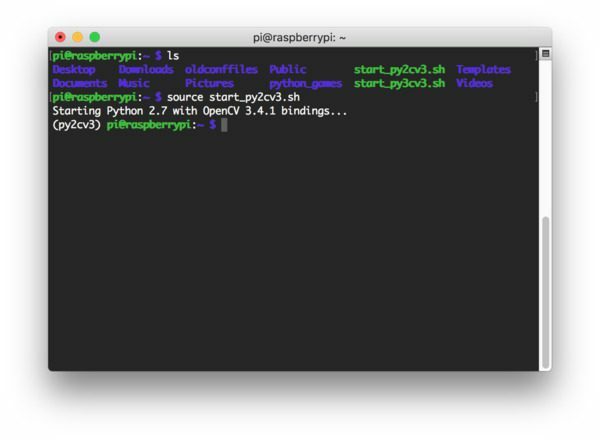 Figure 4: How to access the Python 3 + OpenCV 3 environment on your Raspberry Pi. Figure 5: Downloading the source code from Practical Python and OpenCV using the Raspberry Pi web browser. 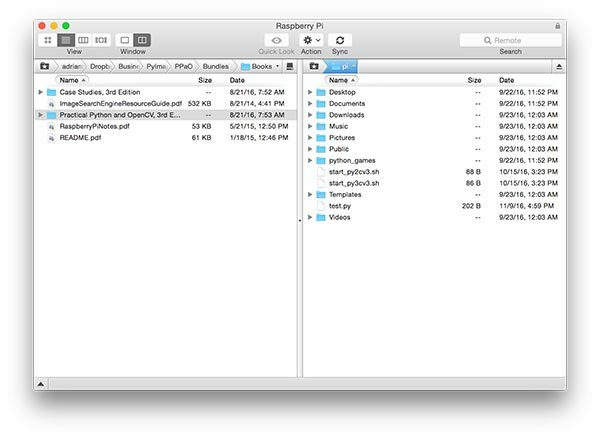 Figure 6: Utilize a SFTP/FTP client to transfer the Practical Python and OpenCV code from your system to the Raspberry Pi. Figure 7: Using the built-in text editor that ships with the Raspberry Pi to write code. 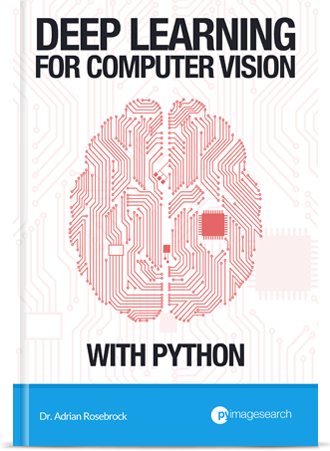 I would suggest either downloading the Practical Python and OpenCV source code via web browser or using SFTP/FTP as this also includes the datasets utilized in the book as well. However, manually coding along is a great way to learn and I highly recommend it! You will then be able to execute Python examples that utilize cv2.imshow and see the results on your laptop/desktop screen. Then simply close your SSH connection and re-connect. Note: Mac users may first need to install XQuartz to utilize X11 forwarding. Windows users should check their respective SSH client documentation for instructions on how to use X11 forwarding. In this section, I detail the answers to frequently asked questions regarding the Raspberry Pi .img file. Which Raspbian images are compatible with which respective hardware? I do not recommend trying with the Raspberry Pi 2 or the Raspberry Pi Zero (non-W). What if I want to install OpenCV + Python on my Raspberry Pi by myself? By all means, I encourage you to do so. It’s a great exercise and you’ll learn a lot about the Linux environment. I would suggest you follow one of my many free tutorials on installing OpenCV + Python your Raspberry Pi. Again, this pre-configured Raspbian image is intended for readers who want to skip the install process and jumpstart their education. How long will it take to install Python + OpenCV by hand? I’ve ran the numbers and even if you know exactly what you are doing it will take a bare minimum of 2.2 hours to compile and install OpenCV on a Raspberry Pi 3B+ and approximately 14 hours on the Raspberry Pi Zero W.
If you have never installed OpenCV before or you are not familiar with Linux-based environments that number can easily jump to many times those numbers based on my survey of novice readers who successfully installed OpenCV on their Raspberry Pi. In fact, to install everything on the Raspberry Pi Zero W including 2 environments (2 compiles of OpenCV) it took approximately 6 days (without babysitting the process overnight). It really comes down to how much you value your time and how quickly you want to get started learning computer vision. I always encourage you to use my free tutorials on installing OpenCV on the Raspberry Pi, but if you want to save yourself time (and headaches), then definitely consider going with the pre-configured Raspbian .img. 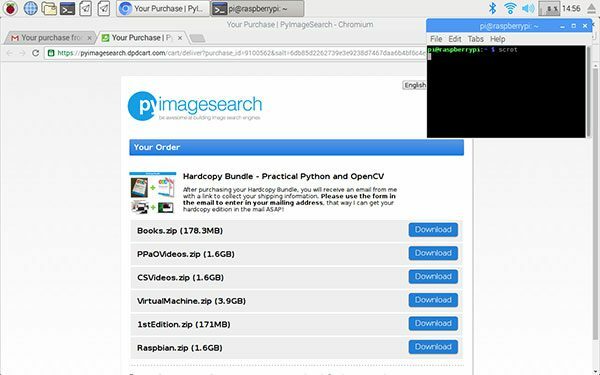 Which Practical Python and OpenCV bundles is the Raspbian image included in? The pre-configured Raspbian image is included in both the Quickstart Bundle and Hardcopy Bundle of Practical Python and OpenCV. The pre-configured Raspbian image is not included in the Basic Bundle. After installing your distribution of Raspbian, how do I access Python + OpenCV? 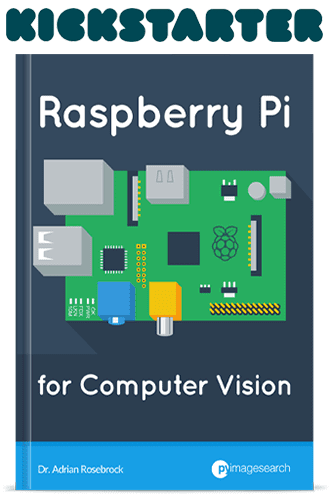 See the “Using Python and OpenCV on your Raspberry Pi” section above. Is Wolfram’s Mathematica included in your Raspbian distribution? No, I am not legally allowed to distribute a modified version of Raspbian (that is part of a product) with Mathematica installed. 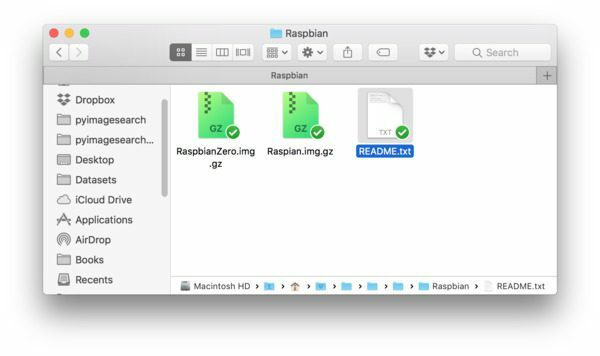 How did you reduce the size of the Raspbian image file? To start, I removed unneeded software such as Wolfram’s Mathematica and LibreOffice. Removing these two pieces of software alone saved nearly 1GB of space. From there, the size of the main partition was reduced. Which Operating System version of Raspbian is included? The Raspberry Pi 3B/3B+ image runs Raspbian Stretch. The Raspberry Pi Zero W runs Raspbian Jessie due to better compatibility with OpenCV (I learned the hard way and I want you to use my images to save the headaches and frustrations I encountered). What Python packages are installed on the Raspberry Pi? After accessing either the respective py2cv3 or py3cv3 virtual environments run pip freeze to see a full list of Python packages installed. In short, I have included all necessary Python packages you will need to be successful executing the examples in Practical Python and OpenCV, including OpenCV, NumPy, SciPy, scikit-learn, scikit-image, mahotas, and many others. Update: On the Raspberry Pi 3B/3B+ image, I’ve also installed TensorFlow and Keras for deep learning on the Raspberry Pi. I also installed the Dropbox API among other packages. The ARMv6 processor in the Pi Zero W does not support TensorFlow, so neither TensorFlow nor Keras are installed. Where can I learn more about Python virtual environments? My favorite resource and introduction to Python virtual environments can be found here. I also discuss them in the first half of this blog post. Where can I purchase a copy of Practical Python and OpenCV? To purchase your copy of Practical Python and OpenCV, simply click here, select your bundle (I recommend either the Quickstart Bundle or the Hardcopy Bundle), and checkout. If you have a question not listed in this FAQ, please send me a message. 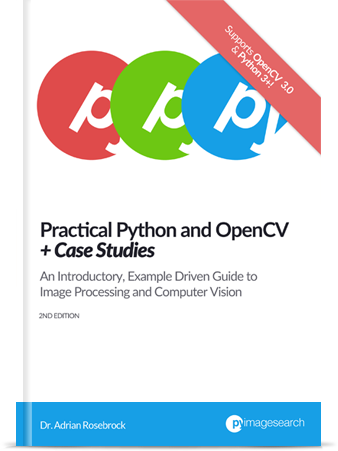 To purchase your copy of Practical Python and OpenCV, just use this link. You will find the pre-configured Raspbian .img files inside both the Quickstart Bundle and the Hardcopy Bundle (the Basic Bundle does not include the Rasbpian .img). 53 Responses to Raspbian + OpenCV pre-configured and pre-installed. Excellent work Adrian, many thanks! I am working with a group of students who are using a USB monochrome camera on a Pi-3; the camera supports 1394 protocol over USB-2 (it’s a Point Grey Chameleon 2), have you any examples using that interface with Python? Thanks Hugh. I don’t have any examples that directly cover the firewire protocol, but I would instead look to see if the camera is compatible with the cv2.VideoCapture function. If it is, this is by far the easiest way to access frames from a video stream for peripheral cameras. where can i get the image file? Hi Sachin — the pre-configured Raspbian .img file is part of the Quickstart Bundle and Hardcopy Bundle of my book, Practical Python and OpenCV. You should make it freely available. Why make is something that user pays for? Hey Atas — the Raspbian .img file is included in both the Quickstart Bundle and Hardcopy Bundle of Practical Python and OpenCV. Once you purchase your copy you will be able to download a file named “Raspbian.zip”. Inside this .zip file is your Raspbian .img file. I was waiting for this for some time. This is really helpful Adrian! I have just finished installing OpenCV on a CHIP computer (9 bucks). Compiling takes even longer (~9 h), so I preferred using apt-get, but I get only Opencv 2.x, which is fine (at least for now). I wish Chip would have a way to backup and restore, so that I can just flash an *.img file like I can on RPi. Btw, do you think this img would run on RPi zero also? Let me boot up my Raspberry Pi Zero and test it out. I will edit this comment as soon as I get the result. EDIT: Confirmed. I just booted up my Raspberry Pi Zero and confirmed that my Raspbian .img file will work with the Pi Zero as well. I have included a photo as proof here (the terminal is simply demonstrating that Python can import the OpenCV bindings). The Raspbian .img file is part of the of the Quickstart Bundle and Hardcopy Bundle of Practical Python and OpenCV. 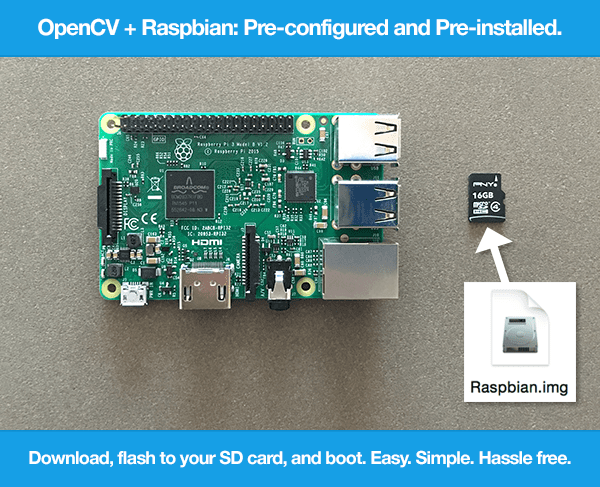 You would need to purchase one of these bundles to download the pre-configured Raspbian + OpenCV .img file. Have a wonderful time with all your friends and family. You’re an very class act and I look forward to another year! How do I rebuild opencv in your new img. 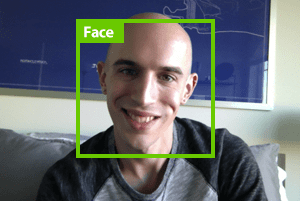 I want to rebuild it because of a opencv bug in face.hpp I commented something out, and now I want to rebuild opencv how would I do that? If you would like to install compile + install OpenCV again you would need to download the source, make your modifications, and then re-run CMake and make. I would refer to my previous tutorial on installing OpenCV on the Pi for more information. Notice that Mathimatica and Wolfram icons are dead in the menu bar. Were these removed from the build? Yes, they were removed from the build. Please see the “Is Wolfram’s Mathematica included in your Raspbian distribution?” section of this post for more details. What default password have you set for the user ‘pi’ in this pre-configured image? I have been following your blog for quite a while and have created an application which I want to run automatically when my raspberry PI boots. Do you know if it is possible to get a virtual environment to run on power up? when the python script runs I get an error message along the lines of can’t find cv2 implying that the virtual environment is not running. If not, I will start with a clean image and install opencv manually, following one of your blogs of course! Absolutely. Take a look at this post on running a Python script on boot. Hi and thanks for the valuable posts you do. I’d like to know (probably I just missed it) the raspian version you’ve installed opencv on, is it pixel? Hey Roberto — you are correct, the Raspbian version that comes with OpenCV pre-installed has PIXEL. What application do you use in mac for SFTP/FTP client? I normally use Transmit or CyberDuck, but you could just as easily use the command line as well. Hey Alok — I’m not sure I understand what you mean. You have a new memory card and you want to install my pre-configured Raspbian .img file on it? great job in providing this package. My question: Is this opencv build also good for c and c++ programming? Thanks. Yes, you can use this same install for C/C++ programming with OpenCV as well. The pre-configured Raspbian .img file runs Raspbian Jessie. It supports Python 2.7 + OpenCV 3 and Python 3 + OpenCV 3. Does one have to format an SD card that came with the RPi-3 Kit? The SD card already has NOOBS on it. Can I just use WIN32DISKIMAGER and write Raspbian.img onto it? Hi Shirish — yes, you can use Win32DiskImager to flash your Raspbian .img file onto the SD card, exactly like the Raspbian tutorials on the official Raspberry Pi site. Once I get the Pi running with the Raspbian .img file is it recommended to do a “sudo apt-get update & “sudo apt-get upgrade” ? Yes, it’s best to ensure that your packages are updated. Hey Bashir — thank you for picking up a copy of Practical Python and OpenCV! I assume you using my pre-configured Raspbian .img file? If so, pelase see the “Accessing the Python 2.7 + OpenCV 3 environment” or “Accessing the Python 3 + OpenCV 3 environment” section of this post. I think you are likely forgetting the “workon” and/our “source” commands. I hope that helps! Does the preconfigured image that you are currently distributing included the optimization’s from your “Optimizing OpenCV on the Raspberry Pi” post? Yes, along with a few additional libraries such as dlib as well. I downloaded the pre-installed ISO with opencv and python, I have raspberry zero, but it just looked like a screen with colors, it does not boot. Hey Bruce — was this for the Raspberry Pi Zero or the Pi Zero W? Hey Amar — it sounds like for whatever reason the firmware update hurt your install. I would suggest re-flashing your Raspbian .img file to your SD card and booting. Hey Ahmad — the Raspbian .img file is included in the Quickstart Bundle and Hardcopy Bundle of my book, Practical Python and OpenCV. I purchased the Quickstart Bundle with the Raspbian .img file. I’d like to add files to the py3cv3 virtual environment within the included Raspbian image. Could you specify its location from the root directory? Hey Craig — can you clarify what you mean by “add files”? Are you talking about pip-installable packages? Or special Python packages you are coding on your own machine? I’m having issues loggign in. When I type in pi for the suername and raspberry for the password it says my login is incorrect. The Raspbian OS assumes you are using an English keyboard layout (I also had to use the English keyboard layout to setup the Pi). You can change the keyboard layout using these instructions. Could you switch your keyboard to an English layout just to login and then switch it to whatever layout you need? at first i failed to login to pi user. * now if you want, u can set to login without X-windows.